Magic Whiteboard is a colorful network drawing program, designed especially for kids' entertainment. It is known that drawing, as well as playing with toys and making something with hands develops children's thinking and logic, allows them to develop their brain with the help of motion activity. Magic Whiteboard is a perfect tool developing your children's abilities. It lets kids express themselves by drawing and is a constant source of fun and joy for the entire family. Magic Whiteboard is designed not only for individual use, but also for collective drawing in a home network. 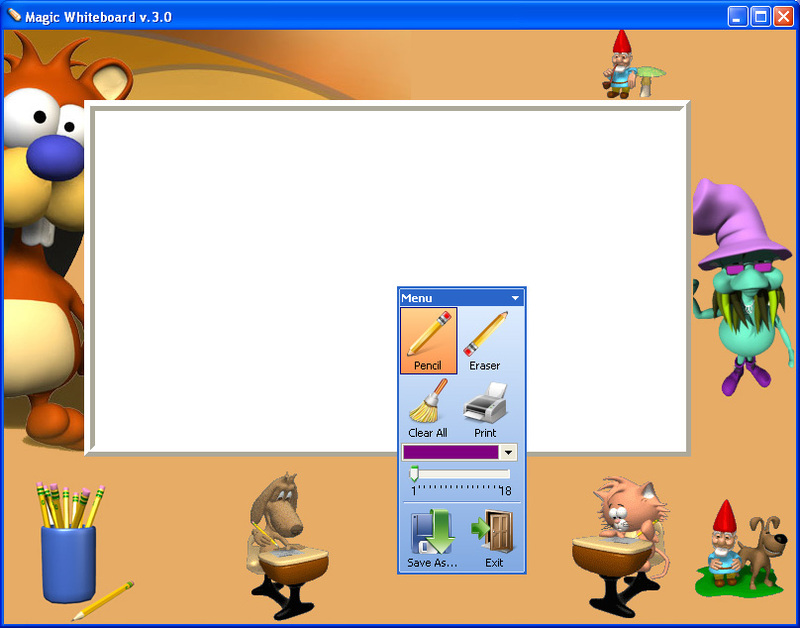 This program can be used in a home PC network with up to 5 computers, so you and your kids can draw pictures all together at the same time. The main feature is that you all are drawing at the same "sheet" or "board" on the screen. So, if you have another PC or laptop, you can play with your kids or let their friends draw something together. With Magic Whiteboard you can show a real miracle to your kid: you can hide with a laptop in another room and draw some pictures on the screen, and your kid will definitely think that there is a lovely small kitty or a cute dog or one of two nice dwarfs that is drawing with him and adding more details to the picture. Or, you can just watch your kids drawing, and surely you will discover a lot of interesting things as children often create very unusual images. Learn more about your kids' way of thinking, worldview, imagination and skills with Magic Whiteboard. It gives a handful of ideas how to spend your spare time having fun with your kids. Magic Whiteboard allows printing and saving drawings in such common formats as BMP, JPEG, and GIF. No doubt, its colorful graphics and amusing cartoon characters make this program a really fascinating pastime. Available for Windows ME/NT/2000/XP/2003/Vista/Windows7/10. This release includes bug fixes. Top 4 Download periodically updates software information of Magic Whiteboard 3.5 full version from the publisher, but some information may be slightly out-of-date. Using warez version, crack, warez passwords, patches, serial numbers, registration codes, key generator, pirate key, keymaker or keygen for Magic Whiteboard 3.5 license key is illegal and prevent future development of Magic Whiteboard 3.5. Download links are directly from our mirrors or publisher's website, Magic Whiteboard 3.5 torrent files or shared files from free file sharing and free upload services, including Rapidshare, HellShare, HotFile, FileServe, MegaUpload, YouSendIt, SendSpace, DepositFiles, Letitbit, MailBigFile, DropSend, MediaMax, LeapFile, zUpload, MyOtherDrive, DivShare or MediaFire, are not allowed! Your computer will be at risk getting infected with spyware, adware, viruses, worms, trojan horses, dialers, etc while you are searching and browsing these illegal sites which distribute a so called keygen, key generator, pirate key, serial number, warez full version or crack for Magic Whiteboard 3.5 download. These infections might corrupt your computer installation or breach your privacy. A keygen or key generator might contain a trojan horse opening a backdoor on your computer. Hackers can use this backdoor to take control of your computer, copy data from your computer or to use your computer to distribute viruses and spam to other people.